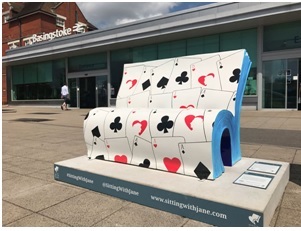 Basingstoke's 'Sitting With Jane' is proving extremely successful for Hampshire visitors as the creative art trail encourages people to follow in the footsteps of Jane Austen - writer of such books as Pride and Prejudice. Thousands of people have been visiting the unique, colourful ‘BookBenches’ enjoying original artwork and discovering sites of significance to Jane Austen’s early life and other interesting places to visit – all for free. 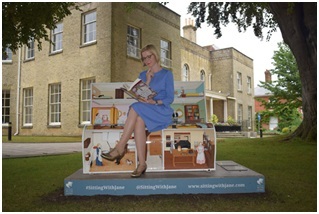 It's been just two weeks since this has been launched and until 30th August 24 BookBenches will be displayed around the Borough of Basingstoke and Deane and beyond, taking visitors on a fascinating tour of the area. The trail is all part of the wider celebrations of Jane Austen’s life in Hampshire on the 200th anniversary of her death. Visitors can walk around the trail with an app that has already over 1,000 people have downloaded it for free. The trail is getting huge attention from all over the world on social media with reports of Jane Austen fans abroad travelling just to visit the trail. The app allows visitors to find and ‘unlock’ each BookBench and some special offers, vote for their favourite, upload their images and see how many other people are doing the trail. After the end of the trail, the BookBenches will be auctioned on 15th September with proceeds to the Ark Cancer Centre Charity. The Wild in Art project, Sitting With Jane, is being delivered by not-for-profit company Destination Basingstoke, and has been entirely funded through sponsorship including headline sponsor, Festival Place. Trail maps can be picked up from local attractions or you can download the free app to guide you around the trail, more information is available on the website. What are you waiting for? Take on the trail now and see the history of Jane Austen's novels and life.